The National Association of Private Schools is a consortium of Christian Educators and Private School Administrators from across the United States and Canada. The Association is dedicated to recognizing and improving the spiritual and educational quality of Private and Christian Schools, regardless of size. 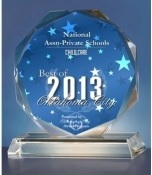 FOR IMMEDIATE RELEASE OKLAHOMA CITY May 14, 2013 -- National Assn-Private Schools has been selected for the 2013 Best of Oklahoma City Award in the Child Care category by the Oklahoma City Award Program.